Shrimp curry sounds exotic but it is really quite a simple recipe to make. You can make this curried shrimp, like all other curry recipes, as hot or as mild as you like. Parboil potatoes for 3 minutes. Drain and set aside. Sauté the onion and garlic in the oil for several minutes until the onion is transparent, then add the curry powder and fry, mixing with the onions for a few minutes. Add the tomato paste, fish stock or water, and chopped mushroom stalks. Add the herbs. Bring to a boil, then lower the heat. Add the parboiled potatoes, the cauliflower and the mushrooms to the mixture and simmer for 25 minutes. Add the shrimp and lemon juice and simmer a further 10 minutes on a low heat. Season to taste. Curry recipes are wonderful served on a bed of cooked rice. The traditional Indian rice is Basmati, but it will taste fine with white rice too. Great served with your favorite chutney. Omit the bay leaves from this shrimp curry recipe, as it already calls for one in the pot. Or, mix the recipe in the traditional way it is stated here and leave out the bay leaf from the recipe above. To kick up the heat a bit add as many drops of hot sauce as you can take. If you prefer hot peppers, finely chop a bit of hot chili peppers and add them when you add the other vegetables. Dried and crumbled chili peppers will work just as well. 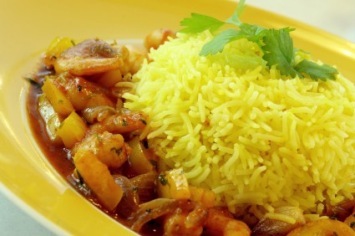 The shrimp curry itself is a wonderful diabetic diet recipe, but watch the amount of rice you eat with it. The better way to serve this as part of a diabetes diet is to with vegetable side dishes. Shrimp Curry is just one of our amazing fish and seafood recipes. The list is here.